What's My Beef With Cardio? What’s My Beef With Cardio? 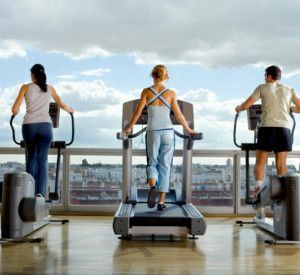 There were cardio machines lining the wall with a beautiful view of the city… Every single machine was filled with people galavanting along while checking out the view. Someone taking in the same view but burning double, if not triple the calories and fat in half the time. Working hard to get my workout finished so I could go out and enjoy what these people were looking at. To be honest, I can’t remember the last time I set foot on a piece of cardio equipment. I don’t warm-up on them, I don’t cool down, and I most definitely don’t “do my cardio” on them. It is incredibly boring, requires no focus, takes too much time, and it doesn’t bring the kind of results I am after. Now don’t get me wrong, if you do the RIGHT workouts on these machines, they will bring you some results. Repeat the same on the right leg. Complete 3 full rounds resting only when needed. Rest as long as needed and repeat 2 more times for a total of 3 sets. After that I was spent. My heart was pounding, my muscles were pumping, and my lunges were ready to explode. What’s even better is that I was in and out of the gym in under 25-minutes. That’s all you really need to get in a great fat burning workout and get the results you are looking for. I can guarantee that if you did the workout above as your cardio instead of the traditional jog on the treadmill or elliptical, your results would double or triple near instantly. Long slow workout produce long, slow results. Short fast workout produce short, fast results. ==> Click Here to get 21 NEW Burpee Challenge workouts that will eliminate boring cardio once and for all!